The Fw 200 Condor was originally designed as a long-range passenger plane and it served in that capacity with several European airlines, but when the Second World War broke out it quickly found its way into wartime usage. The long range and high endurance of the Fw 200 made it an ideal aircraft for hunting ships in the Atlantic, as it could cruise around for hours on end, looking for targets. The most obvious difference between the airliner and the military Condor was the addition of the under-fuselage gondola, with guns in front and back and a bomb bay in between. The passenger section was gutted out and extra fuel tanks were fitted, while additional weapons were added in turrets to the upper fuselage. 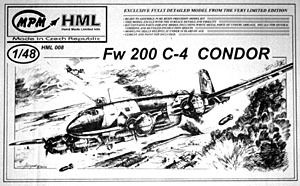 In addition to the standard machine gun and bomb armament, the Condors also tried their hand at using the Hs 293 guided missile. Focke Wulf produced over 260 Fw 200s for the Luftwaffe through the course of the war, and its performance over the Atlantic helped sink hundreds of Allied ships. One word comes to mind upon seeing this kit, and that word is "HUGE"! This is one very large model, with a wingspan and length over two feet. The other remarkable thing about this kit is that it's all resin, except for the vacuformed canopies and white metal landing gear. With all of this resin you hope that it's all well cast, and for the most part it is, even with the large pieces. Once I got over the immense size of this model, I started looking at what all you get in the box. The interior is basic, leaving lots of room for improvements and additions. However, if you look at the instructions first you are led to believe that you get a lot more than what is actually present in the kit. The instructions are very nearly a book in its own right, but only the first few pages are for building the kit. The rest of the pages show what I initially thought was included in the kit, namely a fully detailed cockpit, plus all the detailing behind the cockpit bulkhead (interior fuel tanks, various fittings, etc. 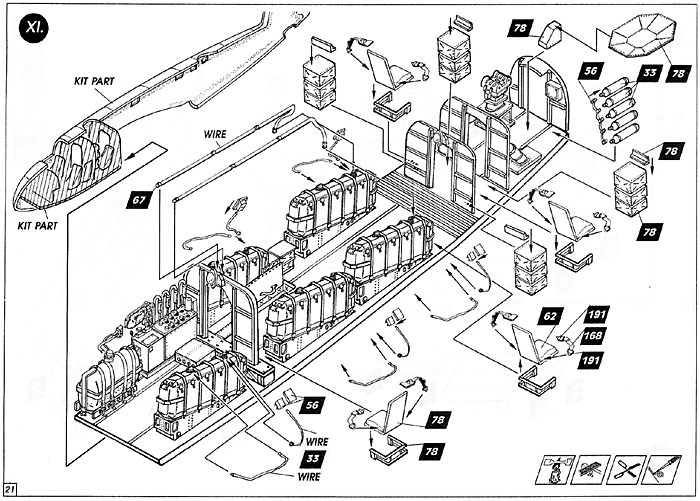 ), plus a complete bomb bay with a choice of either extra fuel tanks or 100kg bombs. Only after looking at the kit thoroughly and re-reading the instructions did I realize that all of this detail is stuff the modeler can ADD, not stuff that is included. To make matters even worse, in all of these drawings showing what you can add, nowhere is there any drawings showing side or top views of anything, so all you have to create these details with is a single isometric drawing, with no measurements to go by. Unless you have some very good reference books on the Condor, these extra pages aren't going to be much of a help. If you do manage to do everything they have depicted, though, you will have a very impressive model when finished, both inside and out. However, out of the box, this kit will merely be impressive on the exterior, which is very impressive indeed. The wings are probably going to be the most problematic items to work with, mainly because of their size and weight. To this end, MPM/HML included an addendum to the instructions suggesting that a wing spar be added. This is going to be essential if you don't want the wings to end up with anhedral instead of dihedral. The outer wing sections are solid and incorporate the upper inboard section, which then rests on top of the single-piece center section. With a spar running through it there should be sufficient strength to support the plane, although you might want to consider drilling into the outer panels and inserting a metal rod for added rigidity. All of this is supported by some very hefty white metal landing gear, which is pretty much essential considering the complex shape of the Condor's gear arrangement. 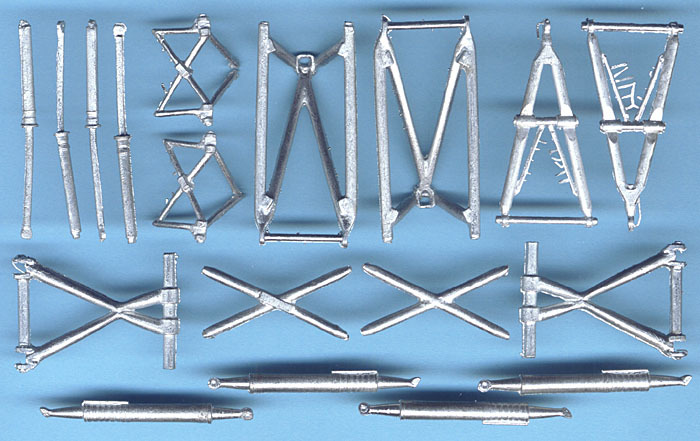 Even still, you might want to replace some parts of this with steel tubing or wire, just for that added strength. The engines are adequate, being front half faces molded onto the nacelle. For the inboard engines there are a couple solid plugs to extend them out further than the outboard ones. The propellers all have separate blades and hubs, so you'll definitely want to build a jig to assemble these things, just to get all the positioning right on all four props. 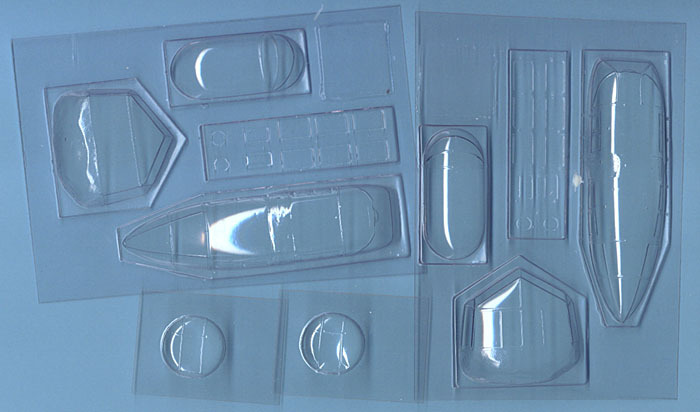 The clear parts are all vacuformed and are crisp and clear. 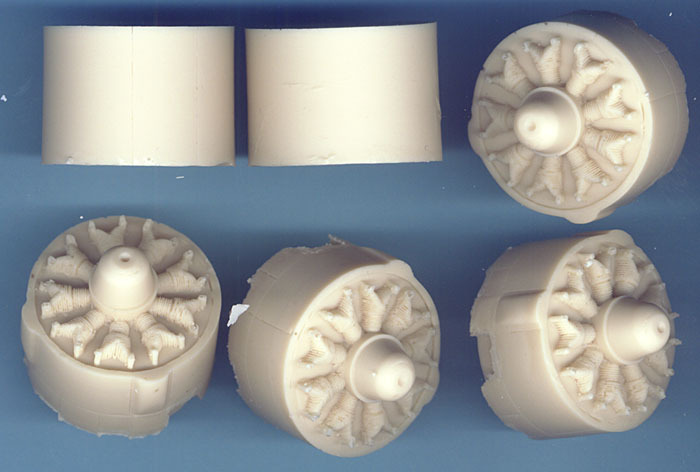 One of the turrets actually was too thin and ended up getting crushed in this example, but MPM/HML anticipated that problem by including two sets of the vacuformed clear parts. So feel free to screw one up in getting it in place, because you've got a backup. For weaponry the only thing included are a couple of large bombs and some outboard wing bombracks. The fuselage bomb bay is closed so you don't have to worry about adding anything in there. 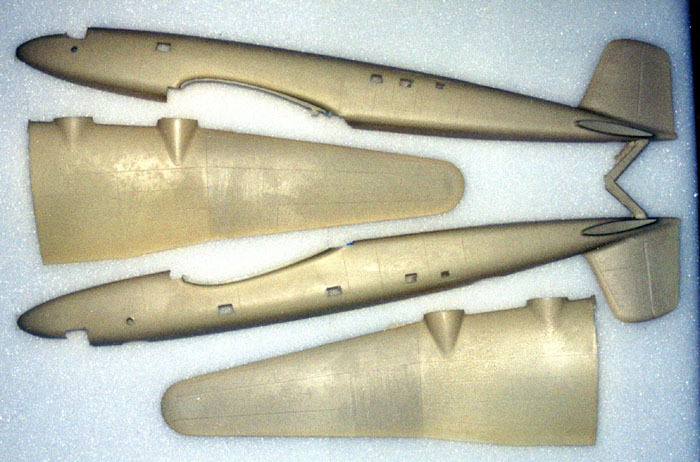 No fuel tanks are included for the recessed sections in the outboard engine nacelles, but you could probably adapt a couple Fw 190 tanks to work there. 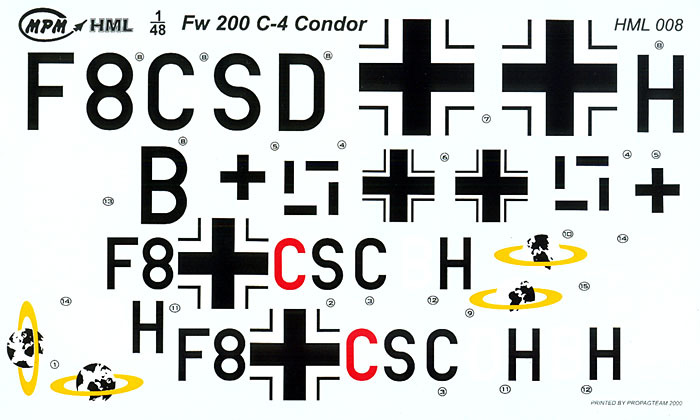 You could also borrow the Fritz X glide bombs from the recent Revell-Monogram Do 217 and hang a pair of those under the wings of this kit for something truly unique. The decal sheet is very large and well printed, giving you several different choices of Condors to do. All of them are finished in the same RLM 70/71/65 camouflage, so the only real change will be in the small details. There are two styles of ringed globes included on the sheet (the Earth is in different positions) and there are differences in rudder markings (some have ship kills), but for the most part one Condor will look the same as the next. Unless you decide to really go all out and convert this kit to one of the earlier airliner Condors, then you can finish it up in Lufthansa markings for something really different. This is an expensive kit of a very large airplane and it will probably only be sold to those die-hard Luftwaffe fans who must have a Condor in their collection. Be forewarned, though, you'd better have plenty of space in your collection for this plane, because it will take up lots of space when it's finished. This is also a model strictly for the advanced modeler who has plenty of experience with short-run resin kits and who has no problem with scratchbuilding things. 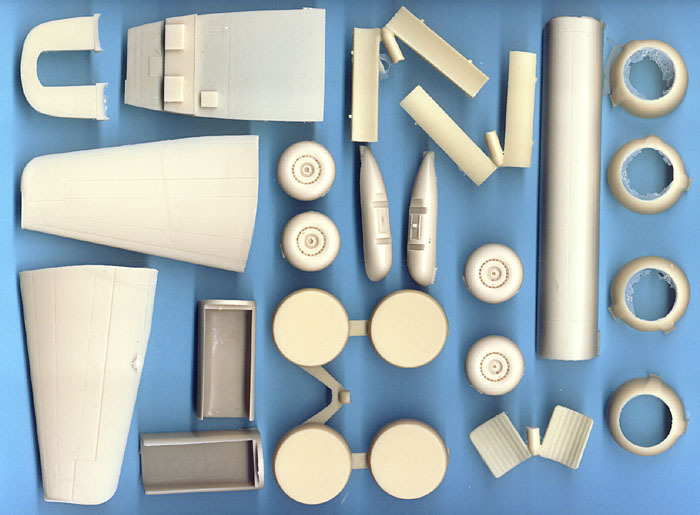 With lots of time and plenty of experience this kit could be made up into a very impressive model, but for those who don't have the time or the experience, you might be better off checking out the Koster vacuform kit of the same subject.